Love this modern laundry room design, a real space saver. 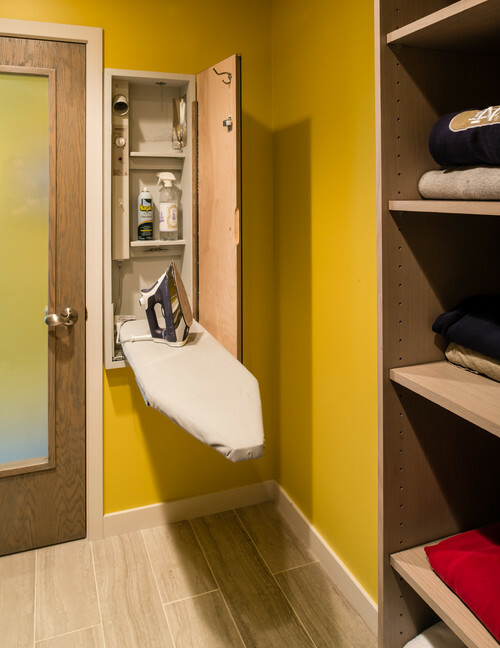 See, the ironing board can be folded and concealed in a covered wall cabinet where shelves intended to store laundry and ironing products can also be found. On one side, open shelves for dried clothes, towels, blankets and linens are also available for proper storage. If you have a spare small room in the house, that could be converted into a laundry room similar to the above design. Space is not really an issue here. Everything could be built in. Pretty awesome!